Villa with 160 m ² housing and a plot of 800 m². It is distributed on one level with 3 double bedrooms, 3 bathrooms with shower, kitchen with office, living room with fireplace and several terraces, one of them glazed.It has solar panels for hot water, heated pool, mosquito nets, awnings, bars, BBQ/barbecue, waredrobes, air conditioning byducts, gasoil central heating, 3 outdoor parking places and a covered one with automatic door.Possibility of making an apartment on the first floor which is now the solariuma roof terrace. Garden with fruit trees and private pool.At Km 3 Las marinas, in 1ª line of beach, 100 m from the beach.In perfect state to enter and live! Villa buil on a 800m 2 plot in the area of Denia Marquesa VI. The Villa has sea views, a large pool of 8x4m with heating, covered jacuzzi area , BBQ with outdoor kitchen, double garage with internal access to the Villa, a separate apartment and much more.The Villa is entered through an automatic entry and you can park the car under a covered porch. Additionaly there are two garages that are accessed via the lower part of the house, with internal stairs. The Villa has solar underfloor heating and gas heating, a large dining room with central fireplace, a large and extensive glazed terrace, an open plan kitchen with dining area. Through large windowdoors you can go out to the swimming pool terrace with swimming pool (8x4m) which can be heated, jacuzzi, shower area, outdoor barbecue. On this floor the Villa has 2 spacious bedrooms with ensuite bathrooms. In addition, a dressing room and a guest toilet. In the upper part of the House there is a glazed terrace offering views towards Denia and the sea.On the lower floor of the House there is a separate apartment with airconditioning, dining room, kitchen, bedroom and bathroom. Also storage rooms and area for the heating, water boiler and technical equipment. Villa for sale in Denia with large rooms, very bright, on a flat plot, garage, views to Montgo mountain and a short walk to town and the beach. 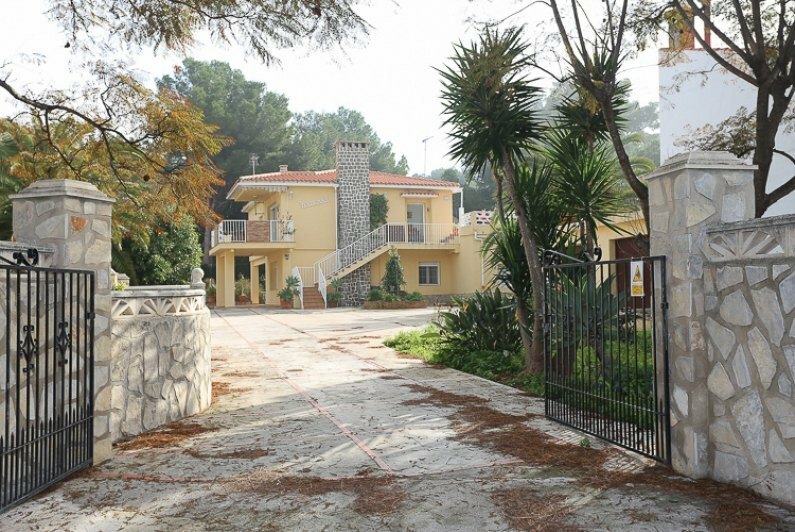 Villa for sale only 2,5 km from the sand beach and town in a quiet dead end street surounded by mediterranean forrest. Las Rotas is one of the most sought after residential areas in the Costa blanca north. This is a almost new high quality house next to Montgo natural park with beautiful mountain views. Plot is 1300 m2 and 350 m2 built. Four bedrooms, two bathrooms, a guest toilet, living room, kitchen, air conditioning, gas central heating, underfloor heating, fireplace, garage for two cars, private swimmingpool. In addition, the plot can be extended up to a maximum of 4350 m2 joining adjacent plots that are also for sale. Villa in Denia for sale, in Santa Lucia. High quality villa near Denia town center with 5 bedrooms, 5 bathrooms and terraces . Garage for 4 cars. Nears schools and all amenities. Villa with character in Denia for sale. Very stylish two-storey villa of 400 m2 with 5 very spacious bedrooms, 4 bathrooms, with a 1500 m2 plot. Large terraces, Private pool. BBQ. Chil-out zone. Air conditioning cold / heat. Well. Storage rooms, parking. Near the sea, town and all the amenities in the best residential area in Denia, Las Rotas. Spectacular views of the Montgó natural park. Villa for sale in Denia. This wonderful villa in Denia is located at the foot of Mongo protected area. 890m 2 plot of land located in a quiet area surrounded by nature. House with 2 floors connected by an interior staircase. Beach at 3 kilometres. Excellent opportunity in Las Rotas!Classic style villa located 200 m from the beach, 2 Km from the centre of Denia and 5 minutes walk from the sandy beach called Marineta Casiana.With a surface of 212 m² and distributed on two levels, each one with its own entrance, the house is bright, has open views to the Montgó and to the sea, wide and comfortable spaces open to the garden.The ground floor consists of a spacious living room with fireplace, kitchen with access to a terrace, four bedrooms and two bathrooms. Upstairs is a dining room with seaviews, kitchen, three bedrooms, one bathroom and two terraces with panoramic views.the House has air conditioning, double glazing windows, barbecue, a well two garages of 27m, heating with low consumption electric radiators. and plot of 1045 m 2.A privileged place for its tranquility and proximity to the beach and the town. If you are looking for a big house, family, in green surroundings and close to the Sea this is your place! Villa for sale in Denia. With great sea views in the most exclusive residencial area in Denia, San Nicolas, near the sea and walking distance to the sand beach, town center and the new marina with shops and restaurants. Beautiful villa with spectacular views.This spacious singlestorey buildings with villa is located on a flat plot of about 1.107 m² offering a panoramic view to the sea and the mountain as well as to Denia's Castle.Terraces with different seating areas characterize the plot of easy maintenance both as the flowerbeds with Mediterranean plants and a multitude of succulents and cactus surrounded by stones and minerals.The main house is distributed in three bedrooms, two bathrooms, a spacious living room with kitchenette and two fully glazed porches. The basement with exterior access has a large heated cellar, a wine cellar and a storage room. Beside the swimming pool of 5 x 10 m (with solar heating and salt water) is the outside kitchen fully equipped with a partially covered terrace. There is also a large garage for two cars and a multifunctional room with toilet and sauna. 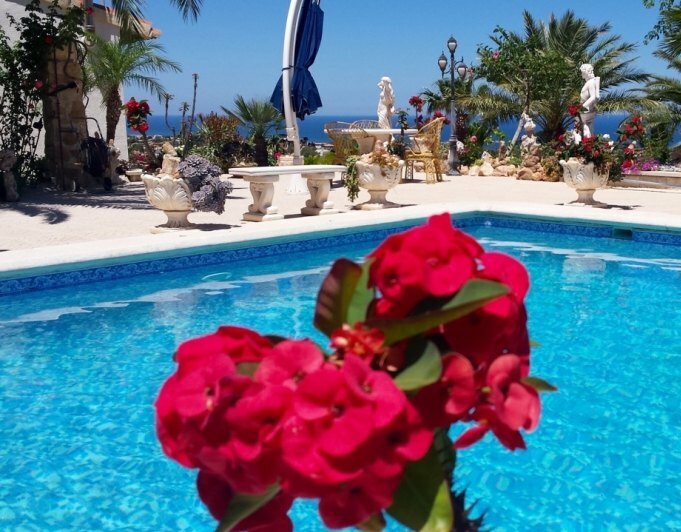 This villa has been completely renovated by the current owner and has gas central heating, air conditioning cold/heat, 2 stoves, marble floors, etc. Villa in Denia for sale. We present to you this great opportunity to purchase a villa built with quality materials and all kinds of details that make this property a unique product in the area. 489m 2, divided in two heights, is composed of 5 bedrooms and 4 bathrooms, a large bright kitchen, a cozy living room with a loft used office and a beautiful rear terrace where you can make life throughout the year , thanks to this glazed, also has a basement with game room, gym, storage room a small workshop. If it already seems a different property, here not just everything... the outdoor areas of the House are another point to highlight, we have a very nice terrace at the entrance next to the pergola, where you can park 3 vehicles, a super barbecue next to the pool area and many precious and particular corners that make property a very special product. One more time.. If count you all the extras and amenities that has, feel free to contact me to visit the property and know it in depth, I promise you that it will surprise you and you can not miss this great opportunity. The property is located in the best residential area in Denia. It has two large livingrooms , one on each floor. Two bedrooms upstairs, one master downstairs with bath room. The living room has a large sofa convertible into a double bed .The first floor has two bath rooms, one in located in the bedroom area and one in the lounge as well , The house is very high quality, modern, spacious, bright and comfortable with a great open kitchen that is integrated and communicated between the dining and living spaces . A very short walk takes you to the sea without crossing streets or roads. The property is fenced. The swiming pool is divided into three areas and depths. The small area is also a Jacuzzi. There is a carport for two cars. The building area can be extended up to 25% of the plots surface. Another under construction building on the plot is a small guest apartment. Villa in Denia for sale, with sea views, terrace, storage room, patio, laundry room, in the area of Santa Lucia residential area, one of the best in Denia, 360º views. Swimming pool, gardens, covered parking. Natural light in all the house with 2 covered porches, roof terrace solarium. Ground floor has a living room, separate kitchen, 1 guest toilet and 2 large bedrooms each one with a bathroom. 1st floor has a large living room with terrace, 1 large bedroom, 1 full size bathroom. Central heating. Air conditioning. New windows with security double glazing. Covered barbecue.